I don't know how often I've mentioned this but I'm totally obsessed with all things Japanese, so when I saw the adverts for the Hyper Japan Christmas Market I knew I had to go. I got some really cute beauty bits along with this kimono, which is just super pretty and the colours are perfect. I can't wait to wear it a bit more in the summer time (yes, I was rather cold shooting this outfit). I also took some photos of the girls I saw dressed up at the Hyper Japan Market so I'll publish a blog post with those in soon! Some of the girls there had gone all-out with their 'kawaii' looks and it was just so fab to see their dedication to the style. Let me know if you'd like to see that? 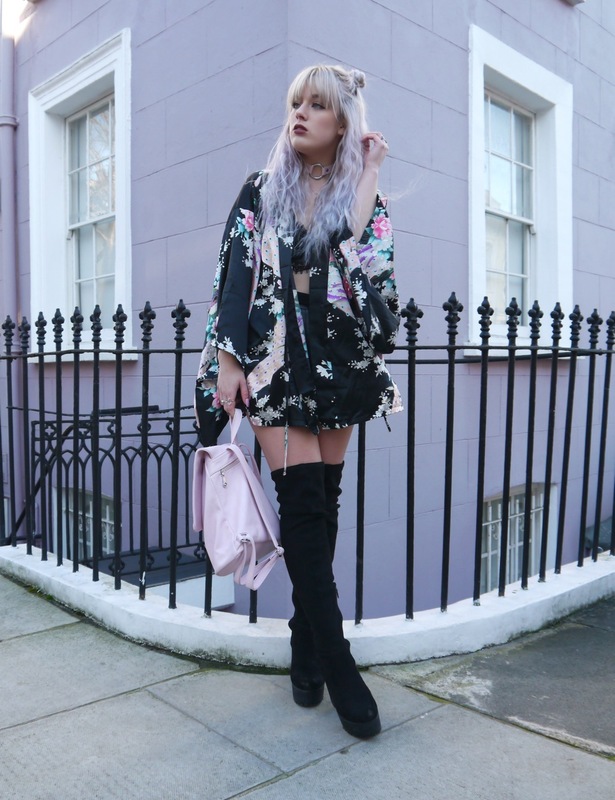 you look fab, that kimono and those boots are a dream! also cannot imagine how cold you must've been taking these! Kimono is supernice, love the print!! And lovely moon necklace! So cool *o* I love your amazing style! I'm in love with this whole outfit! That kimono is to die for but bloody hell aren't you freezing! I cant leave the house without 400 layers in this weather!! very cool look! Love the boots!